Starter kit includes goggles, lab coat, and membership activation card. Each monthly kit includes a colorful Magic School Bus themed 12 page manual with 7 experiments. Explore each topic more on our on-line clubhouse. On-line certificate of completion included. -The Magic School Bus science club delivers a kit to your home once a month for 12 months -Join The Magic School Bus science club and have your children fasten their seatbelts and go on the ride of their lives with Ms. Frizzle and her students on The Magic School Bus. -Here is how it works: 1. Your starter kit will ship within 1 day of receiving your order. The starter kit includes a lab coat, goggles, and activation card. The activation card has instructions as to how to activate your 12 month subscription membership. You will have 6 months to activate your membership. 2. Once you activate your membership, your kits will ship monthly. FREE SHIPPING on your starter kit and 12 monthly kits. 3. 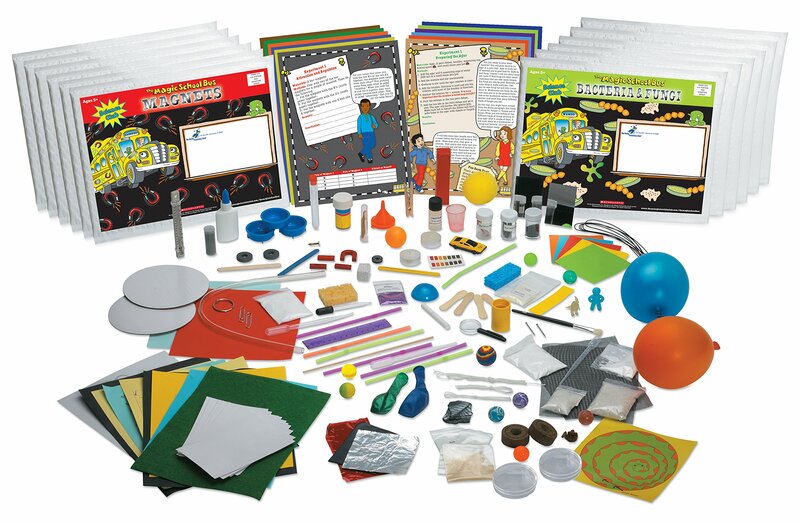 Each hands-on science kit comes with supplies and a colorful manual that includes a parent guide that features characters from the acclaimed TV series, The Magic School Bus. 4. Kits are designed for ages 5-12. 5. The 12 fun and educational topics include Magnets, Acids/Bases, Water, Bacteria/Fungi, Air, Volcanoes, Fossils, Weather Station, Light/Rainbows/Mirrors, Stars/Planets, and Liquids/Solids/Gases. 6. Membership to the club includes an on-line clubhouse, certificate of completion, and a monthly e-newsletter. 7. Developed by a team of Harvard graduates, scientists, and educators, these kits will have Young Scientists experience science in a fun and hands-on manner and at the same time give them an edge with this Educational Science Adventure that will last a lifetime. 8. No refunds available.